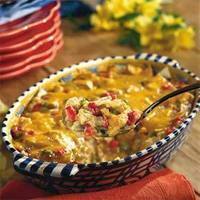 A Delicious Heart Healthy Taco Casserole Recipe That Family And Friends Will Love. Preheat oven at 400. Prepare a 8" square dish with cooking spray; set aside. In a large saucepan, cook chicken, onions, bell peppers, and garlic until chicken is no longer pink. Stir in taco seasoning mix and taco sauce; set aside. Place half the crushed chips onto the bottom of the prepared dish. Add chicken mixture to cover the chips, then cover the chicken mixture with sour cream mixture. Sprinkle with cheese and remaining crushed chips. My mother used to make a dish like this. We loved it! This recipe is totally awesome. I fixed this last night and it seemed to vanish before my eyes. My wife wants me to fix this one and take it to our son's house this week end. We are all meeting there to help him out with fixing up his flooded basement. Made this for lunch today using leftover chicken. Yum. We just had this the other night for dinner everyone enjoyed it and no left overs. I used ground turkey instead of chicken its a keeper. That looks delicious! I like tacos and casseroles too. Nice recipe! Just what I need to make for dinner tonight! It looks tasty.